I went to a WeTest leadership breakfast this morning. We run in a Lean Coffee format and today we had a conversation about how to build confidence in people who have learned basic automation skills but seem fearful of applying those skills in their work. Then she talked about how she buddies these people within her testing team. Traditionally when you have someone who is learning you would buddy them with someone who is experienced. You create an environment where the experienced person can transfer their knowledge or skill to the other. In a situation where the person who is learning has established some basic knowledge and skills, their requirements for a buddy diversify. The types of activities that build confidence can be different to those that teach the material. Confidence comes from repetition and experimentation in a safe environment. The experienced buddy might not be able to create that space, or the person who is learning may have their own inhibitions about making mistakes in front of their teacher. Vicki talked about two people in her organisation who are both learning to code. Rather than pairing each person with someone experienced, she paired them with each other. Not day-to-day in the same delivery team, but they regularly work together to build confidence in their newly acquired automation skills. In their buddy session, each person explains a piece of code that they’ve written to the other. Without an experienced person in the pair, both operate on a level footing. Each person has strengths and weaknesses in their knowledge and skills. They feel safe to make mistakes, correct each other, and explore together when neither know the answer. I hadn’t considered that there would be a difference in pairing for skill vs. pairing for confidence. In the past, I have attempted to address both learning opportunities in a single pairing by putting the cautious learner with an exuberant mentor. I thought that confidence might be contagious. Sometimes this approach has worked well and others not. Vicki gave me a new approach to this problem, switching my thinking about confidence from something that is contagious to something that is constructed. I can imagine situations where I’ll want to pair two people who are learning, so that they can build their confidence together. Each person developing a belief in their ability alongside a peer who is going through the same process. There has been conversation on Twitter recently about conferences who do not offer speaker compensation. If you haven't been part of this discussion I would encourage you to read Why I Don't Pay to Speak by Cassandra Leung, which provides a detailed summary. 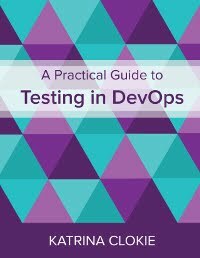 I take an interest in these conversations from two perspectives: I regularly speak at international conferences and I co-organise the annual WeTest conferences for the New Zealand testing community. As an organiser, the events that I help to run cover all speaker travel and accommodation. We make a special effort to care for our conference speakers and have built a reputation in the international testing community as being an event that is worth presenting at. WeTest is a not-for-profit company that is entirely driven by volunteers. How do we afford to pay all of our speakers? Our 2014 WeTest conference was a half-day event in a single city. We had 80 participants who paid $20 per person. They received a conference t-shirt along with a catered dinner of pizza and drinks. All of our speakers were local to the city, so there were no travel or accommodation expenses. Our budget was balanced by the support of our primary sponsor, Assurity. By 2016 we felt that we had built an audience for a more ambitious event. We embarked on a full-day conference tour with the same program running in two cities within New Zealand. We had 150 participants in each city who paid $150 per person. This was a significant jump in scale from our previous events, so we had to establish a formal scaffold for our organisation. WeTest was registered as a company, we created a dedicated bank account, and launched our own website. This was also the first year that we invited international speakers. 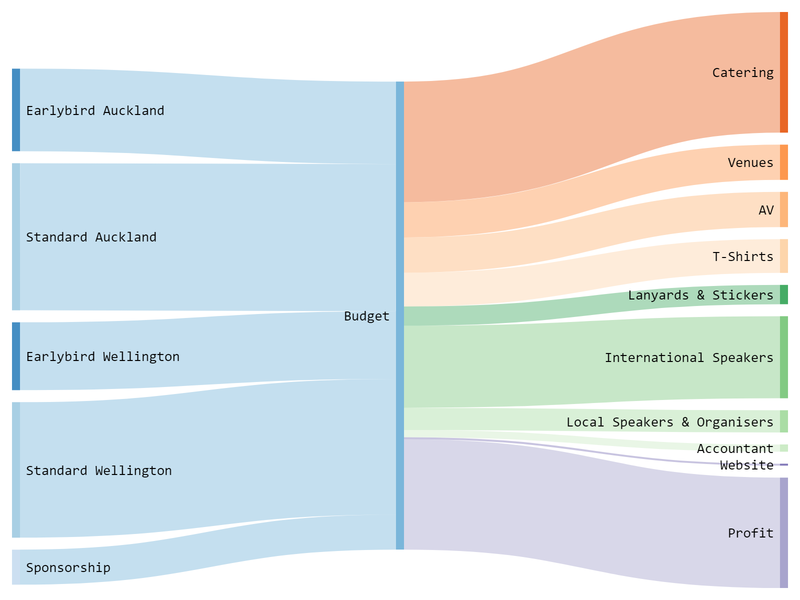 25% of our speaker line-up, or three out of twelve speakers, traveled to New Zealand from overseas. 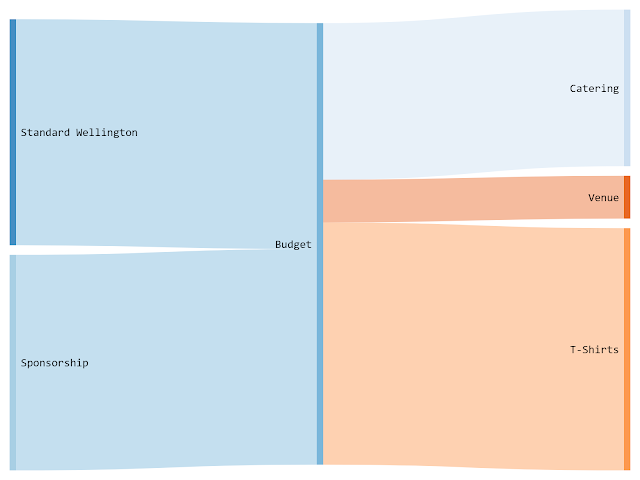 Covering their travel and accommodation costs significantly altered the dynamics of our budget. Running the conference in two different cities meant that there were travel and accommodation costs for our New Zealand based speakers and organisers too. Our 2016 events sold out quickly and we had long waiting lists. To accommodate a larger audience, we grew again in 2017. This meant securing commercial venues, signing contracts, paying deposits, registering for a new level of tax liability and formalising our not-for-profit status. In 2017 we had around 230 participants in each city. We introduced an earlybird ticket at $150 per person, so that our loyal supporters would not experience a price-hike and we could collect some early revenue to cover upfront costs. Our standard ticket was $250 per person. 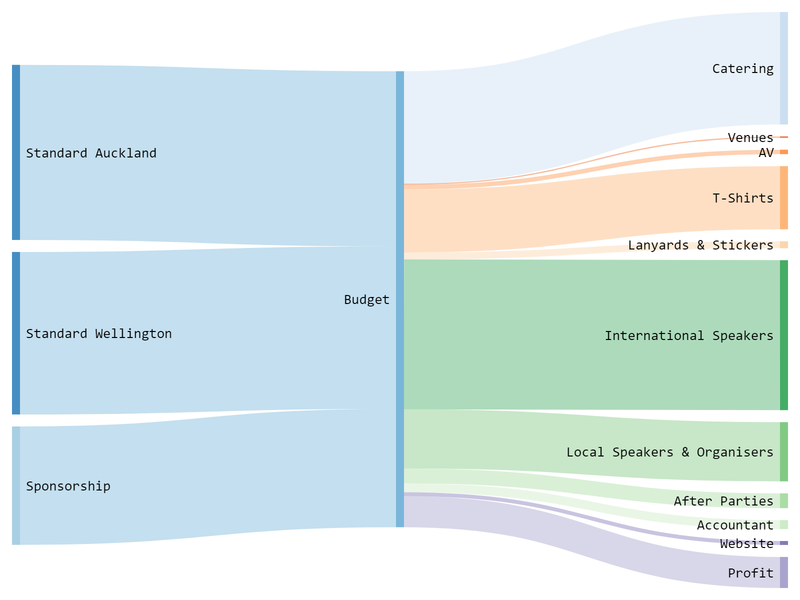 40% of our speaker line-up, or four out of ten speakers, traveled to New Zealand from overseas. We incurred similar speaker travel and accommodation expenses to the previous year. To re-iterate, WeTest is a not-for-profit organisation that is volunteer-led. The profit of our 2017 events will be reinvested into the testing community and help us to launch further events in the New Year. In the discussion about speaker reimbursement we often discuss in the abstract. I hope that these examples provide specific evidence of how a conference might approach speaker reimbursement, whether they are a small community event or a larger endeavour. At WeTest we have consistently balanced our budget without asking speakers to pay their own way. We are proud of the diverse speaker programs that have been supported by this approach. In 2018 we look forward to continuing to provide a free platform for our speakers to deliver great content.